This Suri Alpaca Weather Vane, Vicugna pacos, was crafted entirely in copper. 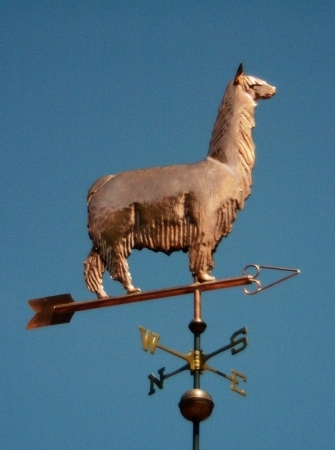 However, we can easily turn this weather vane into a portrait of your alpaca by using optional gold and/or palladium leafing to match its unique markings. There are also several different arrow styles to select from. We are happy to review the choices available to you when you are ready to order. 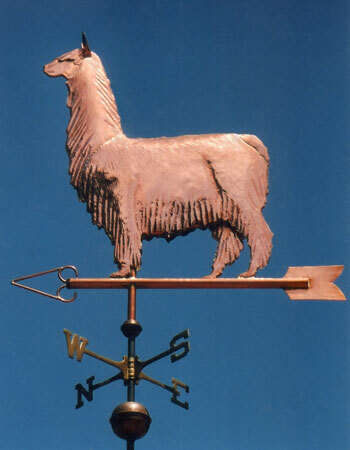 Early on in our careers as weathervane makers, we attended several Llama and Alpaca shows with our brand new creations. We felt very accomplished having mastered sculpture pieces for both Huacaya Alpacas and Llamas. 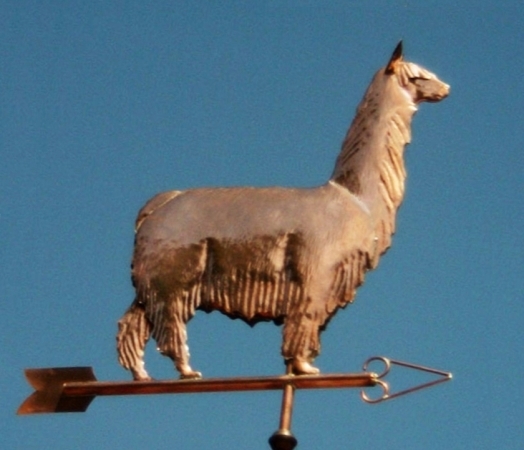 However, it would be ten years before we felt we had the technical skill to create a Suri Alpaca Weathervane. The long flowing curls that make up the coat of a Suri Alpaca, or Suri Llama for that matter, require a sophisticated mastery of the art of copper texturing and shaping. We waited to tackle the Suris until we felt we had the skill to successfully create the effect we envisioned. When we finally accepted a commission to make a Suri Alpaca Weather Vane, both we and our customer and our master craftsmen were very pleased with the final result.